My laptop's keyboard is half functional (literally, like half of the keys don't work), so I'm forced to use an external keyboard. However, since it doesn't have an Fn key (obviously), I want to create a custom keyboard shortcut to change the brightness up and down. So, what command should I execute to change the brightness up or down? I want to create a custom keyboard shortcut for these commands. Edit: I should point out that I took a look at the default keyboard shortcuts and found nothing to help me out. 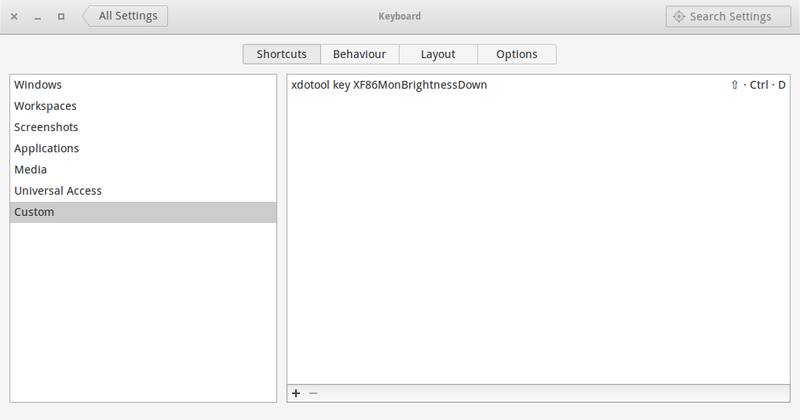 The simple way to adjust brightness from terminal is using xrandr. For more information about xrandr open terminal and run man xrandr. xrandr -q | grep " connected"
ravan@ravan:~$ xrandr -q | grep " connected"
Here,In my system VGA1 is display name. Replace VGA1 with your system display. Here range from 0.0 to 1.0 . For example: xbacklight -inc 20 will increase by 20 percent. by pressing the + button at the bottom and inserting your command and its corresponding keyboard shortcut. You should log out and log back in for the effect to take place. What's the hotkey to run a command?